Ujju Aggarwal is an Assistant Professor of Anthropology and Experiential Learning in the Schools of Public Engagement and an affiliate faculty member in the Department of Anthropology. Her research examines questions related to public infrastructures, urban space, racial capitalism, rights, gender, and the state. She is currently completing her first book, The Color of Choice: Raced Rights, the Structure of Citizenship, and Inequality in Education, a historically informed ethnography of choice as it emerged in the post-Civil Rights period in the United States. Her work has been appeared in popular outlets, scholarly journals, and edited volumes including Transforming Anthropology, Scholar & Feminist Online, Educational Policy, and Feminists Rethink the Neoliberal State: Inequality, Exclusion, and Change (edited by Leela Fernandes). She is co-editor (with Edwin Mayorga and Bree Picower), of What’s race got to do with it? How current school reform policy maintains racial and economic inequality 2nd Edition (Peter Lang, 2019); and co-editor (with Linta Varghese and Rupal Oza) of Women’s Studies Quarterly Fall/Winter 2019. Prior to joining The New School, she was Visiting Joanne Woodward Chair in Public Policy at Sarah Lawrence College. She has been a Visiting Scholar at the Vermont Center for Fine Arts and has also taught at Hunter College (CUNY) and Educational Opportunities Center (SUNY). 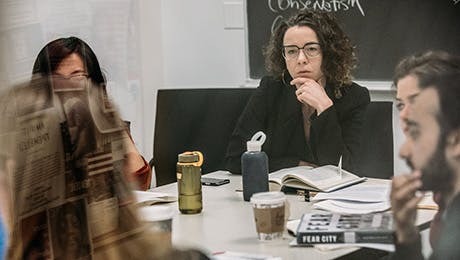 Her research has been supported by the Institute for Urban Policy Research and Analysis (UT Austin), the National Academy of Education/ Spencer Foundation, the Center for Place, Culture and Politics (CUNY Graduate Center), and the Davis Putter Fund. In addition to her academic training, Ujju also brings a long history of working to build local and national organizations that work for educational justice, immigrants’ rights, and transformative justice as well as projects that focus on the intersection of arts and social justice, popular education, and adult literacy. She currently serves as the Co-Chair for the K-16 Committee of the American Studies Association, as an Advisory Board Member of the Parent Leadership Project (Bloomingdale Family Head Start Center, PLP), and as an Advisory Board Member of PARCEO (Participatory Action-Research Center for Education Organizing). School Choice: Raced Rights and Neoliberal Restructuring. In Mayorga, Aggarwal, and Picower, eds. What’s race got to do with it? : How current school reform policy maintains racial and economic inequality 2nd Edition. Peter Lang, 2019. After Rights: Choice and the Structure of Citizenship. In Fernandes, Leela, ed. Feminists Rethink the Neoliberal State: Inequality, Exclusion, and Change. NYU Press, 2018. Defend and Transform. Anthropology News 58, no. 2 (2017): 318-321. The ideological architecture of whiteness as property in educational policy. Educational Policy 30, no. 1 (2016): 128-152. The Politics of Choice and the Structuring of Citizenship post‐Brown v. Board of Education. Transforming Anthropology 22, no. 2 (2014): 92-104.